This is not a sewing machine product, but a high quality leather pouch, made to order. 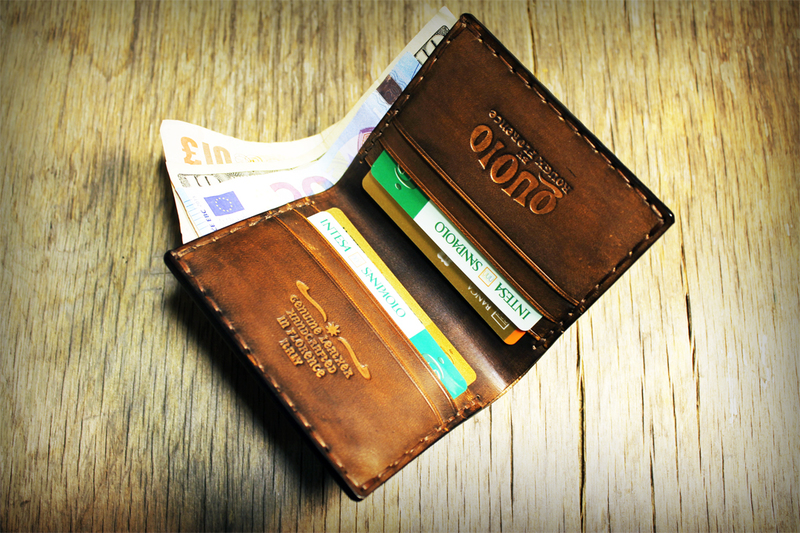 Size: Height 8 cm / 3.15" - Width 9 cm / 3.55" - Leather Thickness 1,5 mm / 0.06"
It is carefully handcrafted in the heart of Florence, Italy, using full grain Italian Vegetable Tanned Leather hand stitched with Waxed Thick Thread. 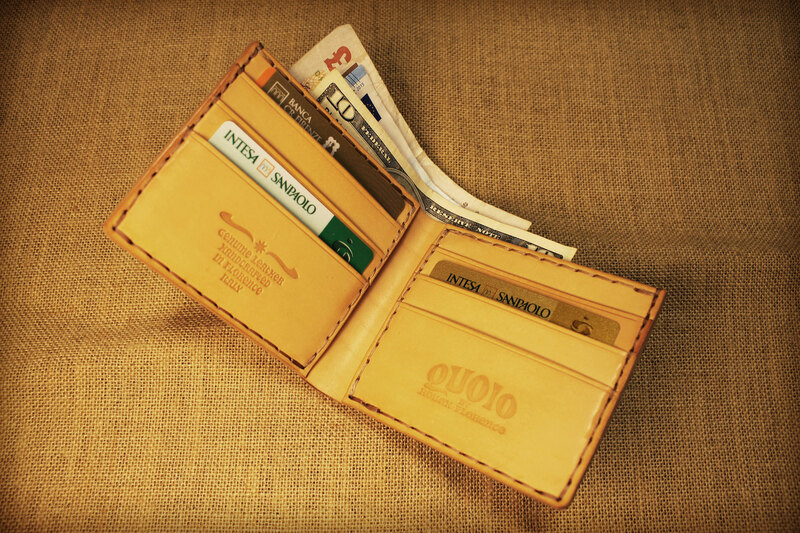 Choose the Leather color from the drop down menu. 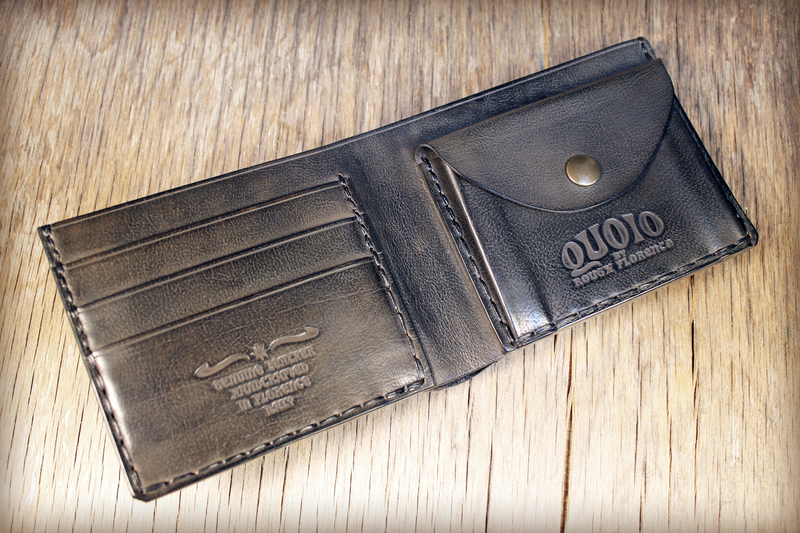 Buffalo leather is genuine and proudly sensitive to the signs of time. 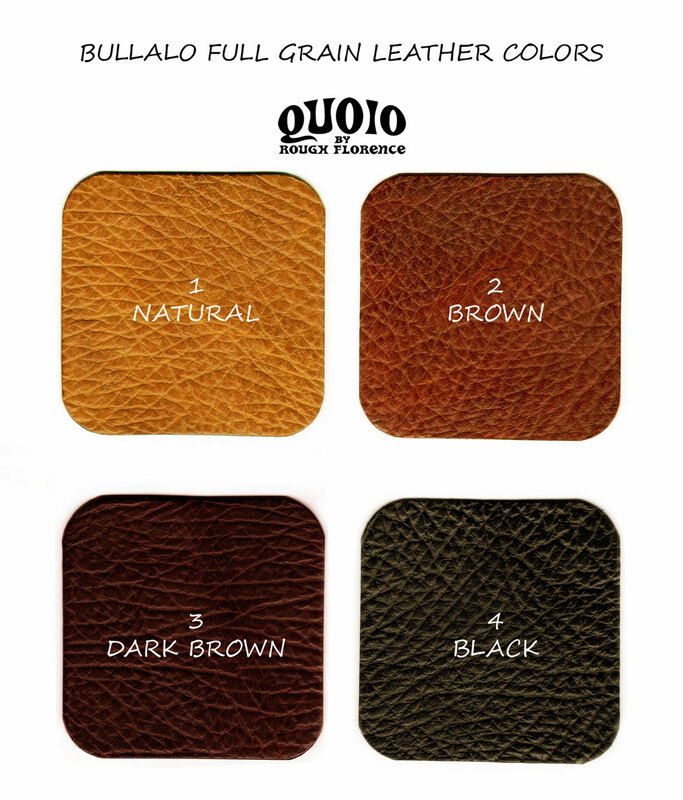 At QUOIO we prefer our items made with the best Tuscan leather of first choice and quality, devote most of our time in creativity and craftsmanship and working patiently every detail, creating something unique and inimitable. Hand dyeing gives to the leather individual character, the color is applied with a pad so we can give to the leather wonderful nuances and a beautiful antique effect which makes this wallet unique of its kind. 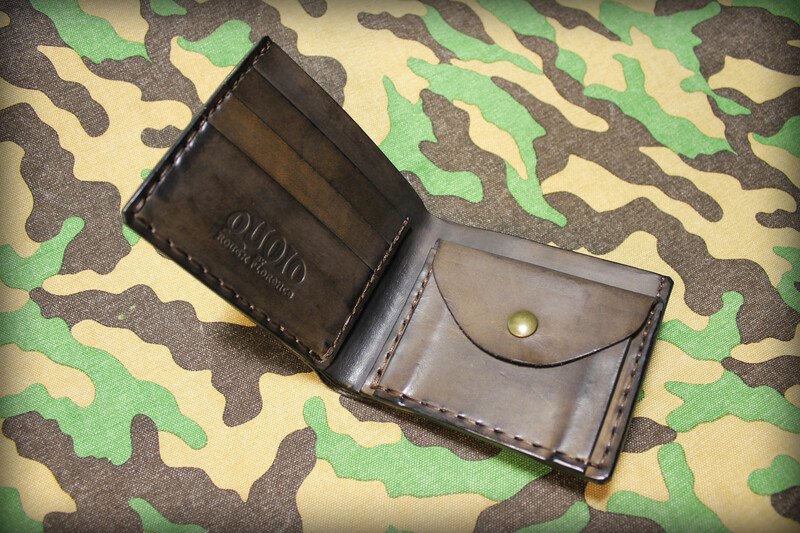 After drying the color is finished with a special polish to enhance the look and protect the leather. 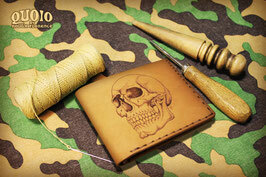 This Item can be personalized with manual engraving of initials, names or short text without extra costs. Customized items cannot be returned or refunded! 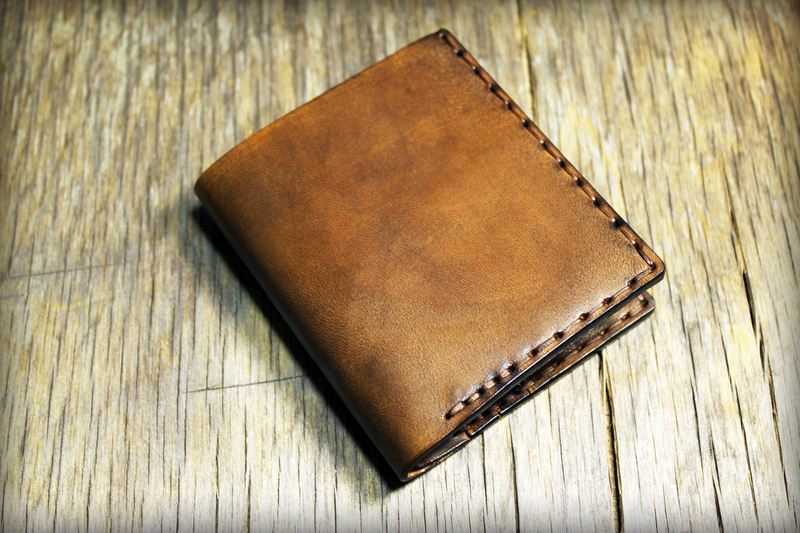 Please pay attention: the leather color may be slightly different from that seen in the photos due to the change in the texture of each piece of leather that I use and because they are hand-dyed. 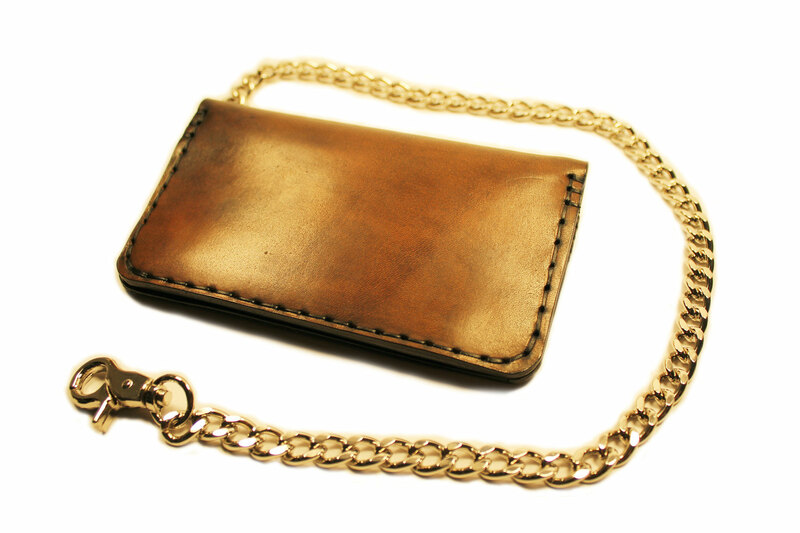 * You pay shipping cost only for the first item! 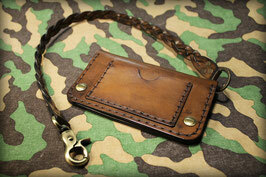 Free shipping on all additional items. 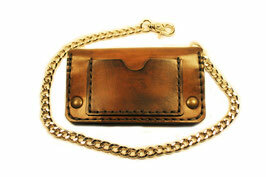 You can track the parce using the code and the link we will provide you as soon as the good is shipped. 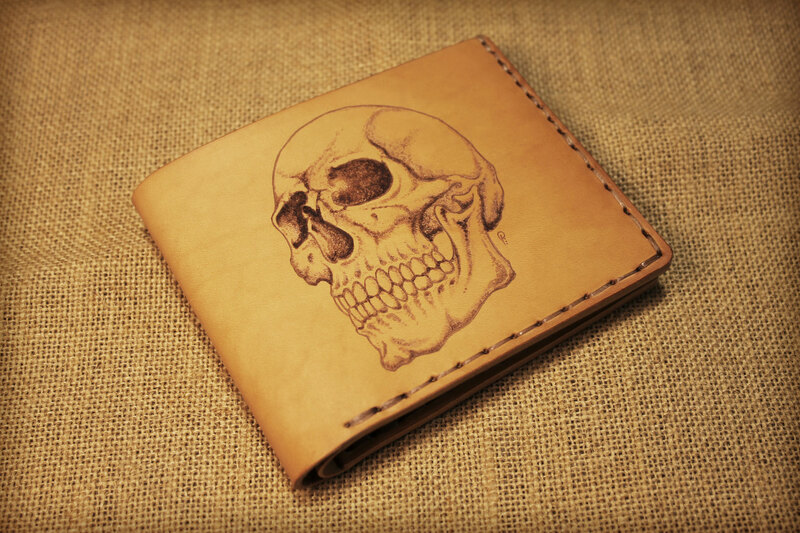 PLEASE PAY ATTENTION: The item/s you order will be shipped to the address written on the order you make on Etsy. 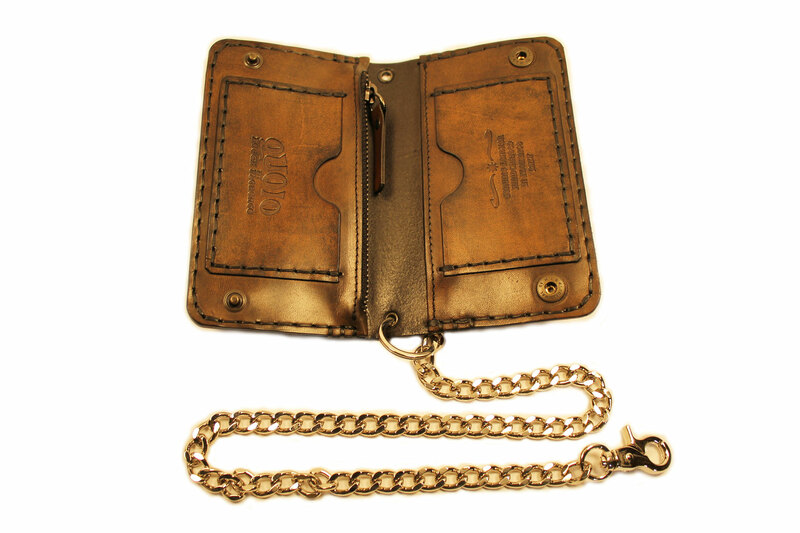 Please make sure and double check that the address is correct and complete, including your mobile phone number and your e-mail to receive shipping status notification. 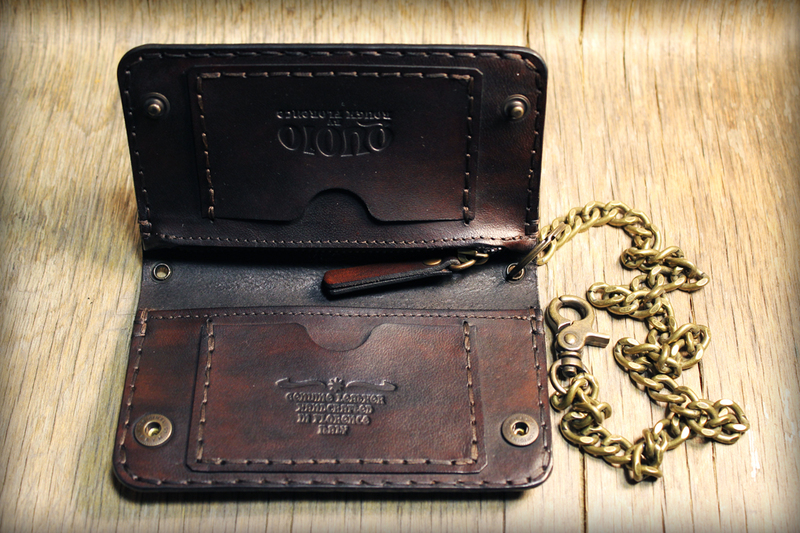 Eyeglasses (Not Included) Leather Snap Pouch Made of Organic Italian Buffalo Leather. 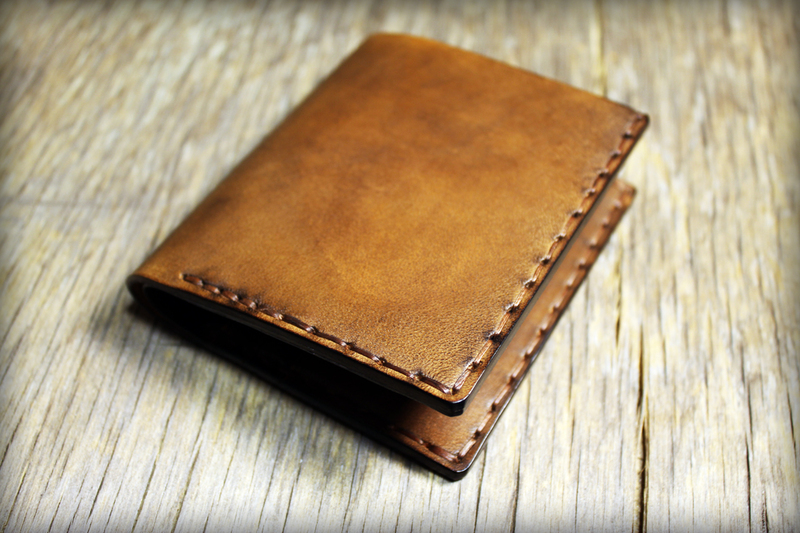 Size: Height 19 cm / 7.50" - Width 9 cm / 3.55" - Leather Thickness 1,5 mm / 0.06"
This is a high quality leather wallet, made to order, hand dyed on natural leather. 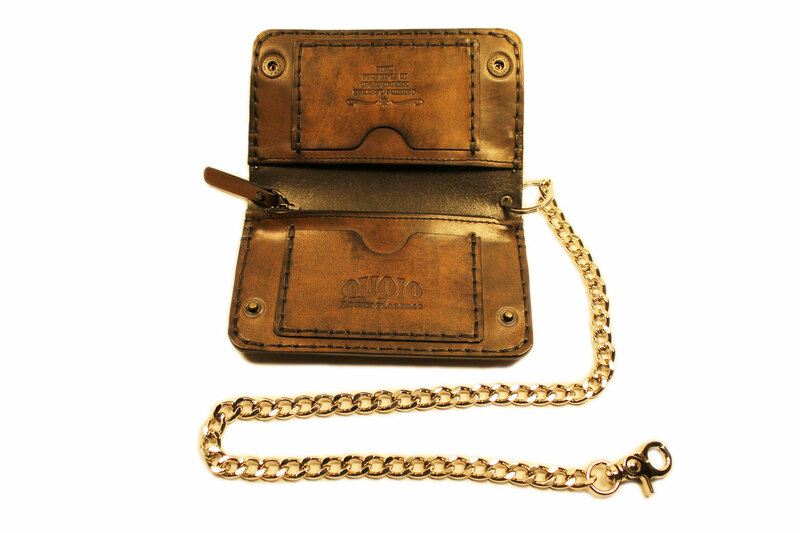 It is carefully handcrafted in the heart of Florence, Italy, using full grain Italian vegetable tanned leather. 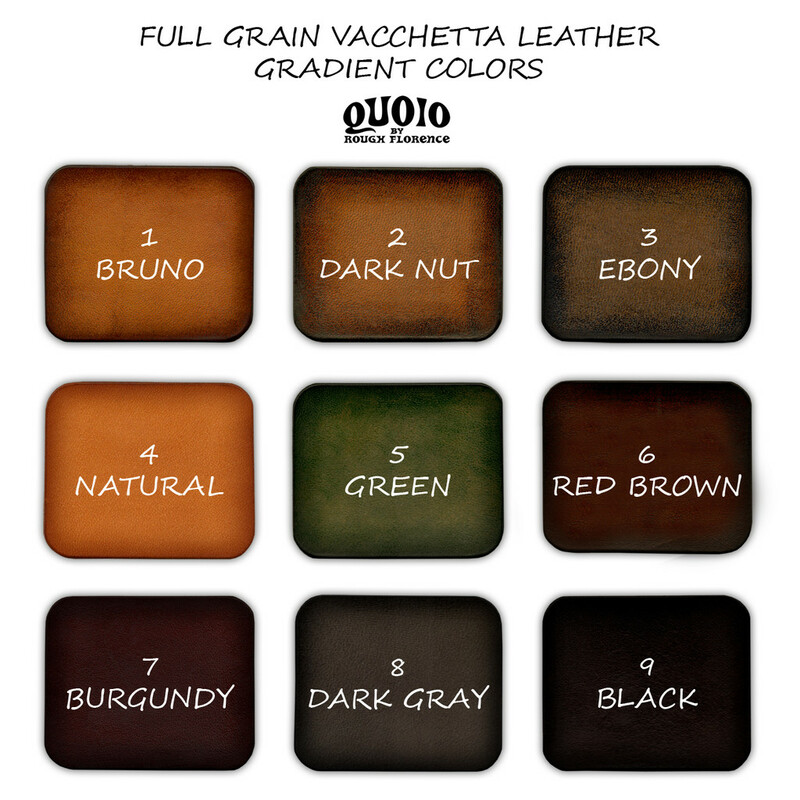 Vacchetta leather is genuine and proudly sensitive to the signs of time. 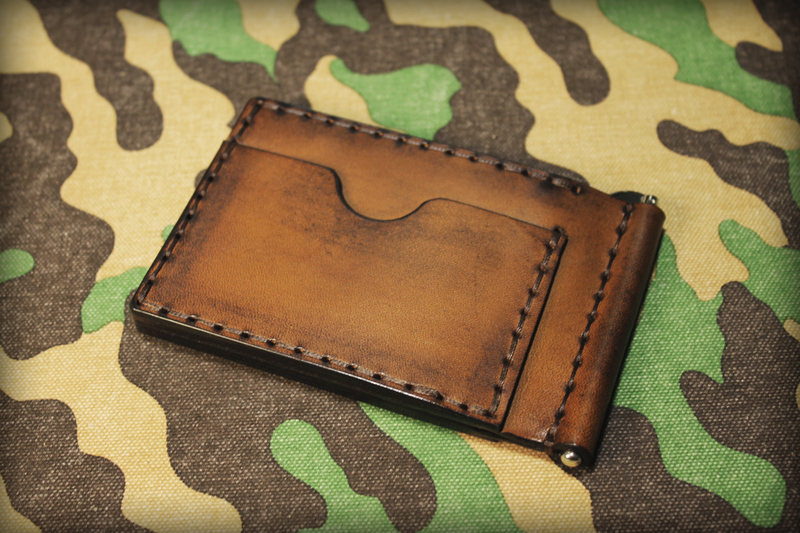 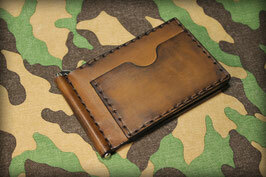 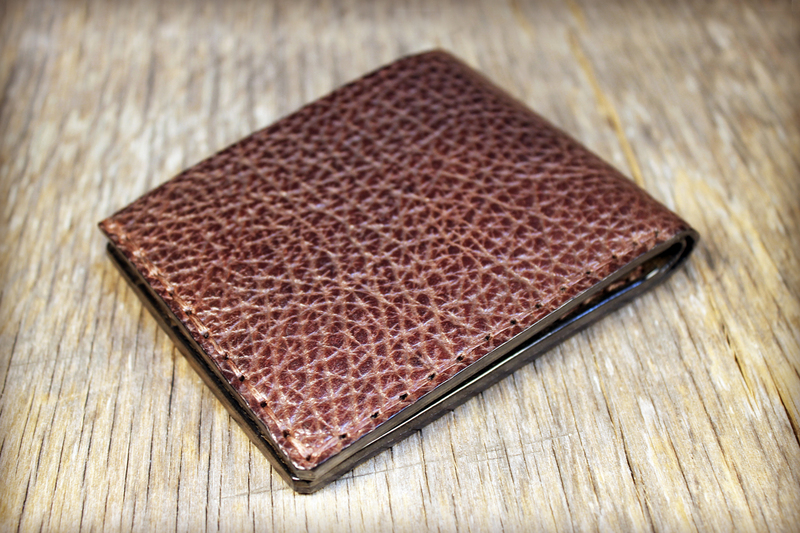 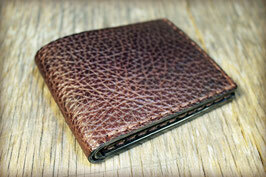 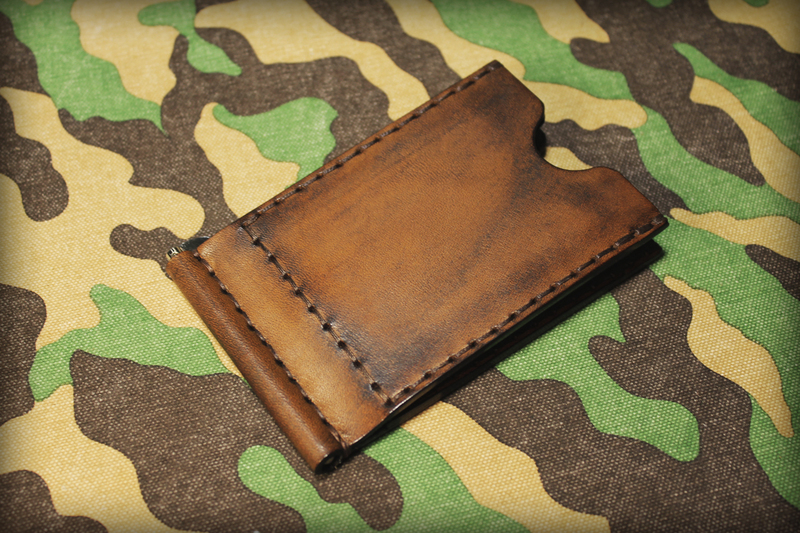 This is not a sewing machine product, but a high quality Full Grain Buffalo Leather card holder, made to order. 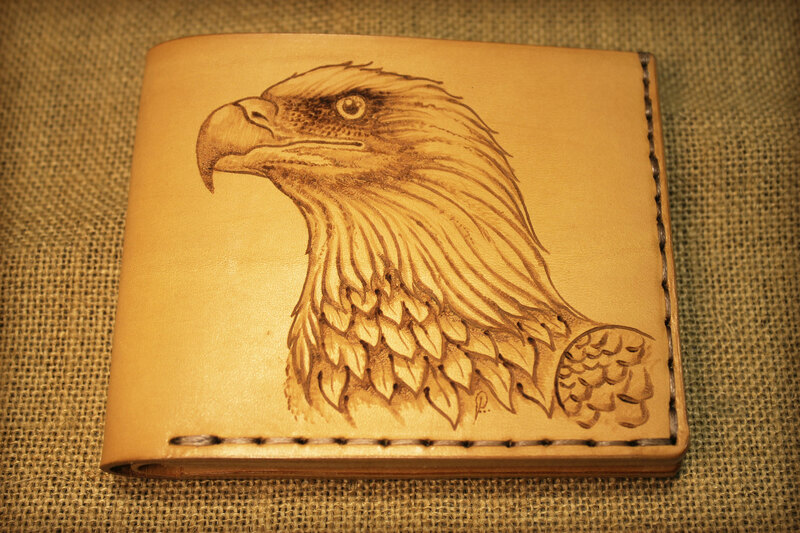 Size: Height 8 cm / 3.15" - Width 10 cm / 3.95" - Leather Thickness 1,5 mm / 0.60"
The "Tattooed" subject on this wallet is a Bald Eagle which represents Strength, Beauty, Pride, Loialty and many other concepts. 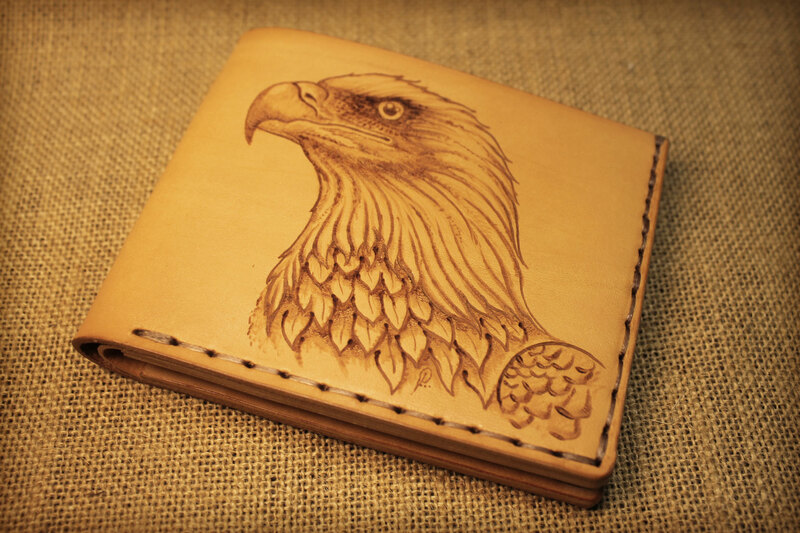 When an artist meets an artisan, that's happened and this is the result! 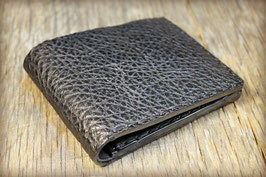 We are proud to present a new line of products entirelly and carefully handmade in the heart of Florence, Italy. 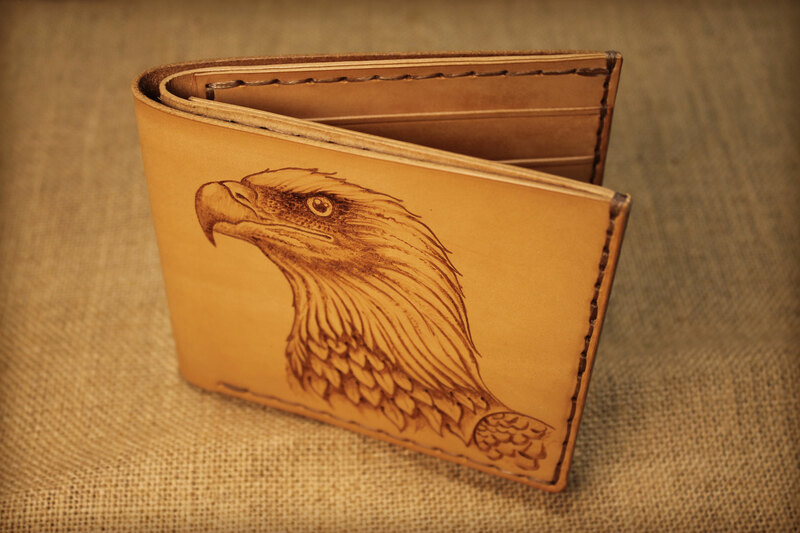 One of our popular veg tan leather wallet is now presented with a unique Pyrography "Tattoo" made by Paolo Montuschi one of the best artists here in Florence. We are sure you will appreciate this unique and inimitable item made by the combination of the finest handcraft process and a master piece of artwork. 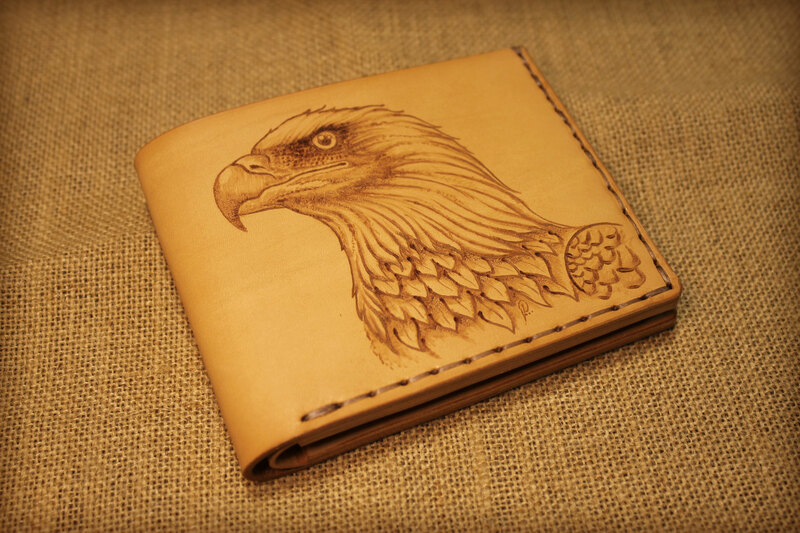 This style is sold only in natural color because we think it gives the perfect result given by hot pen work on Tuscan Vacchetta Leather. 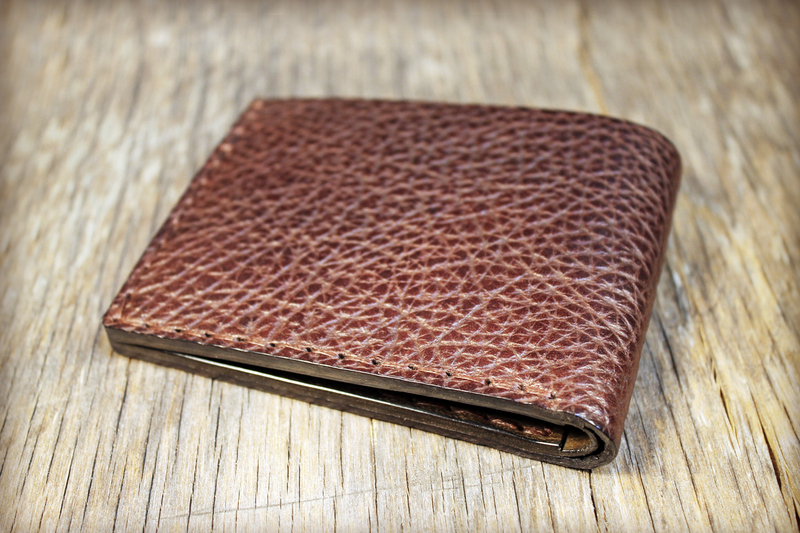 This type of leather is getting an aging look in time because this material is alive. 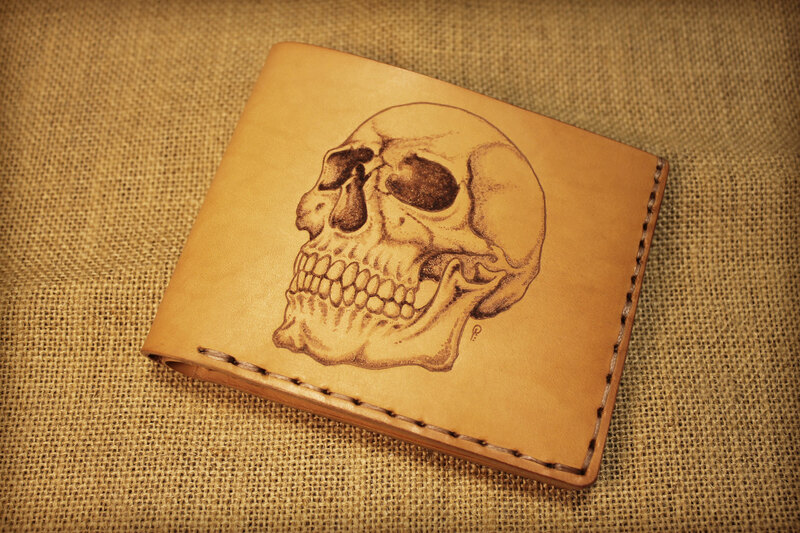 The "Tattooed" subject on this wallet represents a portrait of a real skull of a 17th century Tuscan Monk. 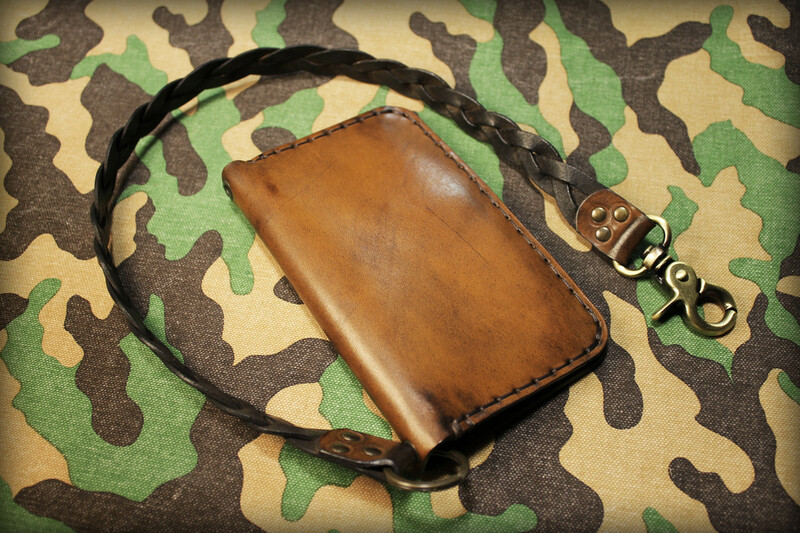 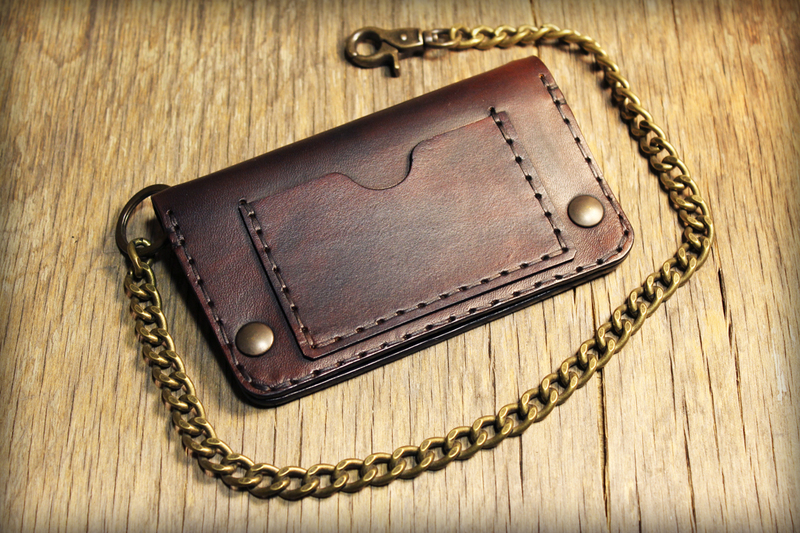 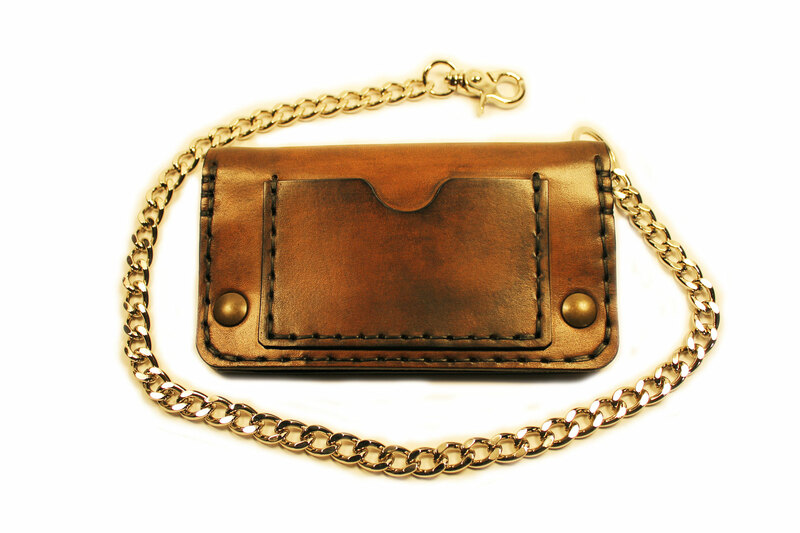 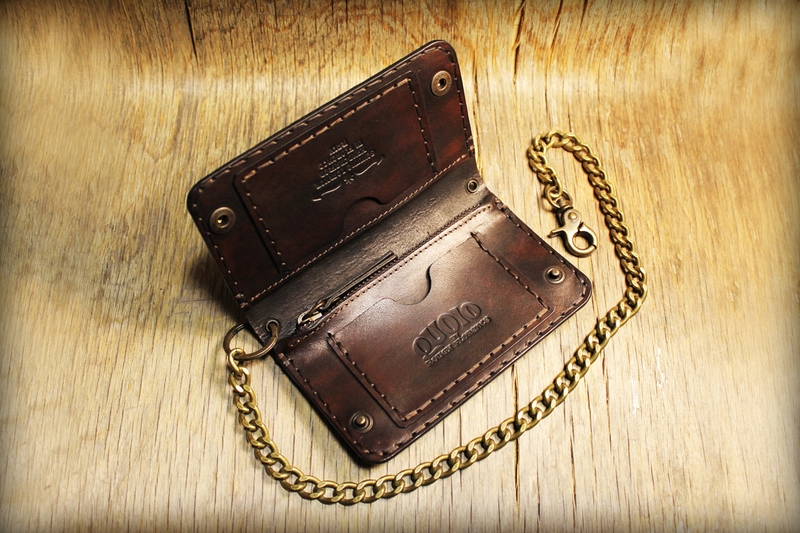 Biker style Chain Wallet with Antique Brass Chain and hook. 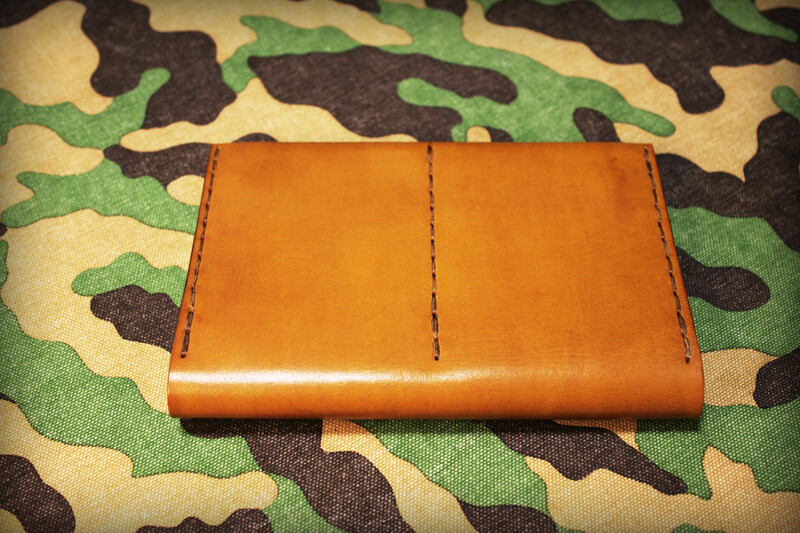 This is not a sewing machine product, but a high quality leather wallet, made to order, hand dyed on natural leather. 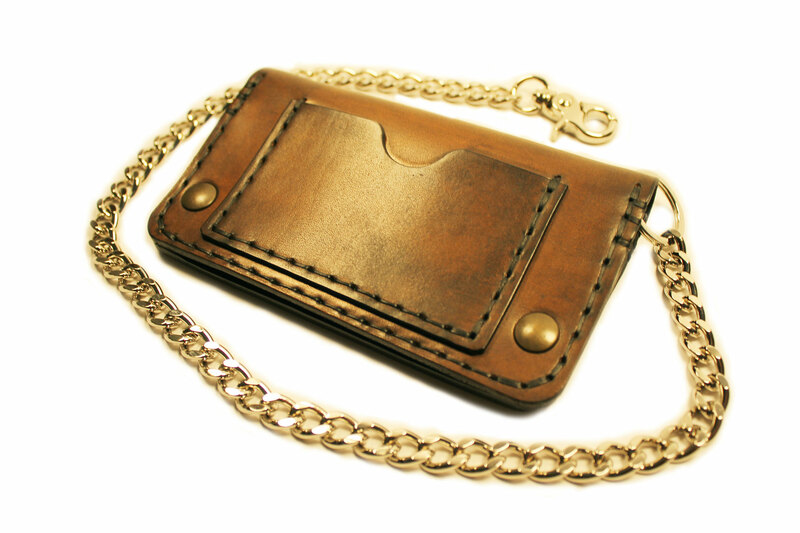 Size: Height 9 cm / 3.55" - Width 15 cm / 5.90" - Thickness 1,5 cm / 0.60"
Biker style Chain Wallet with Silver Finsh Metal Chain and hook. 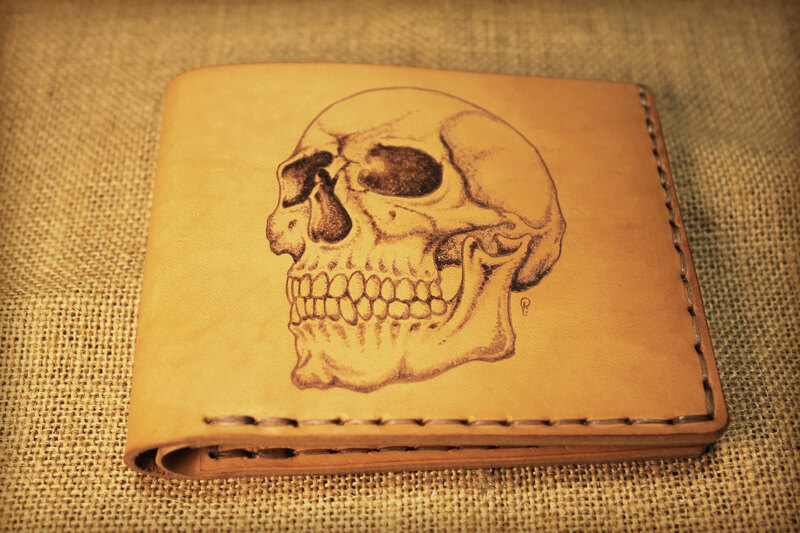 Biker Style Made of Genuine Vegetable Tanned Leather, Raw Edge Hand Stitched with Waxed Thick Thread and finished to achieve warm color and aged look. 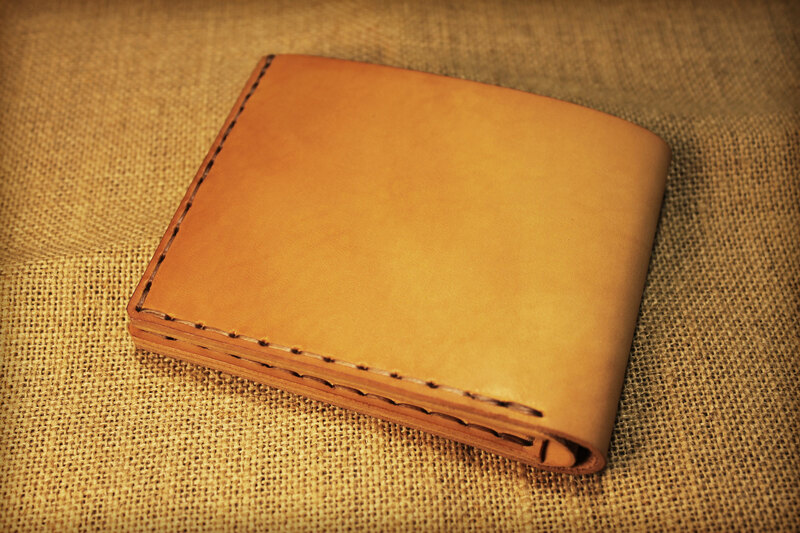 Made of Genuine Vegetable Tanned Leather, Raw Edge Hand Stitched with Waxed Thick Thread and finished to achieve warm color and aged look. 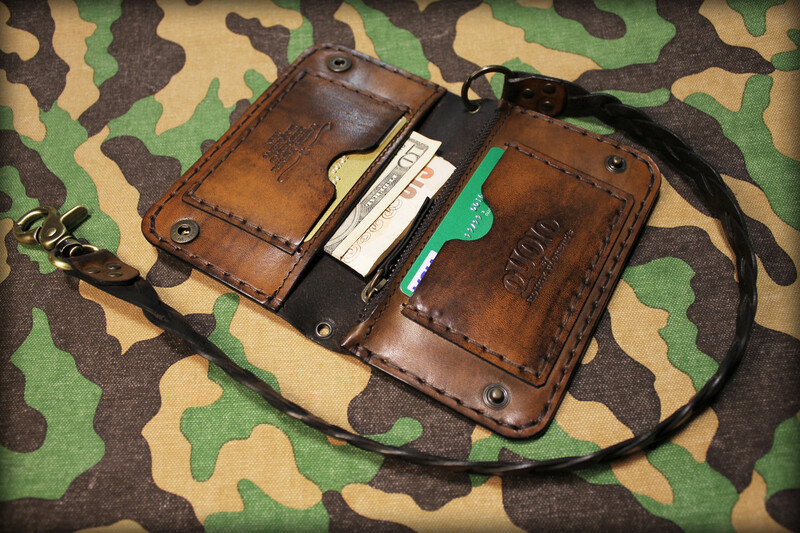 This style with 3 open pocket and one zipped, in addition the are 3 card pockets placed between the main pockets. 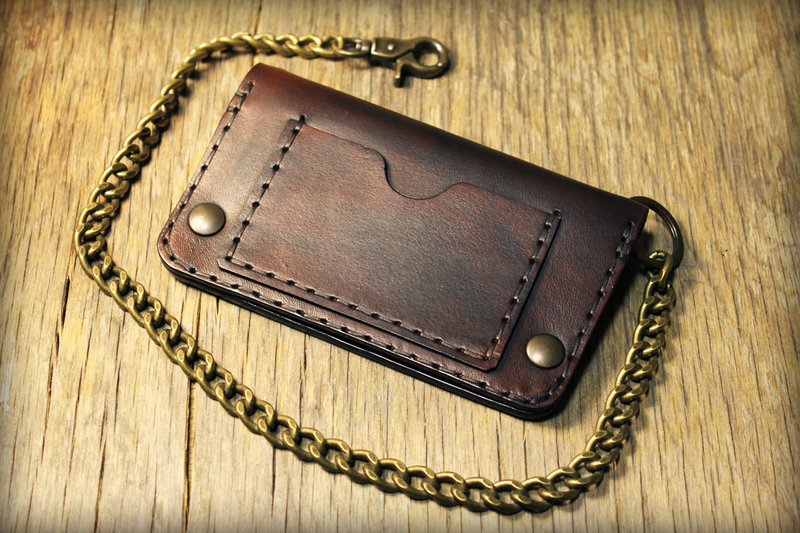 This wallet can hold comfortly your mobile phone such as the iphone 6 Plus model. 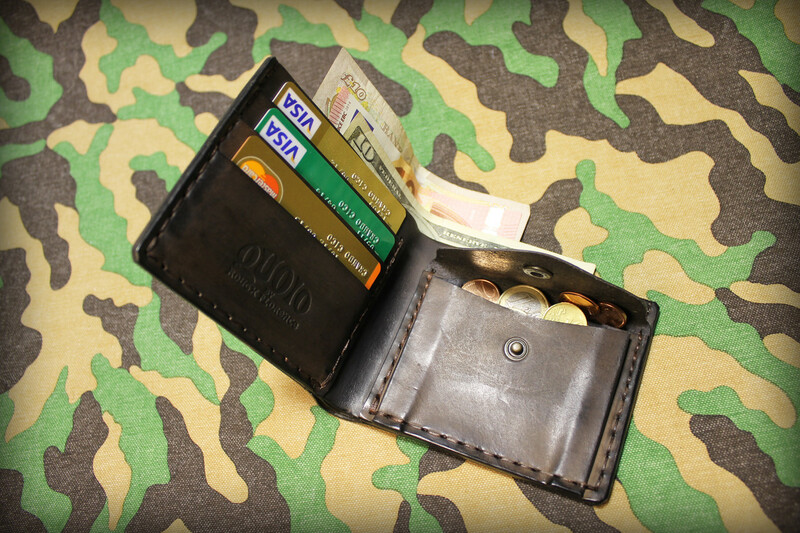 This wallet has 3 main pocket and 3 card pockets placed inside the main pockets and 1 pocket with flap in front. 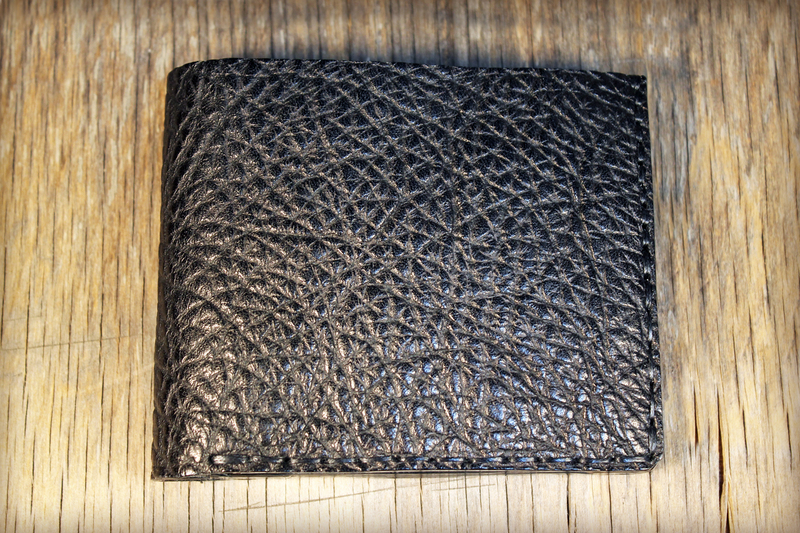 The edges are hand smoothed, rounded and patiently polished with antique manual tools and brushed for a longer life and make them more pleasant to the touch. 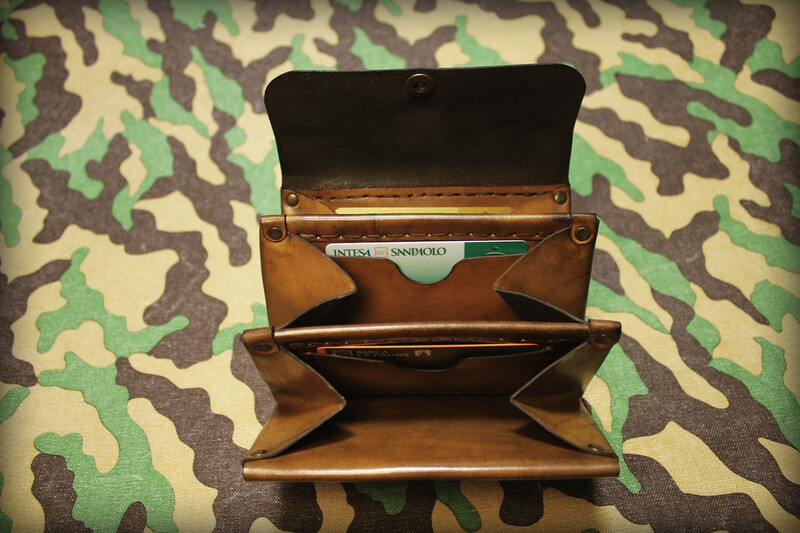 This style features 3 cards pockets + 1 coin pocket + 1 hidden pocket + 1 notes main compartment. 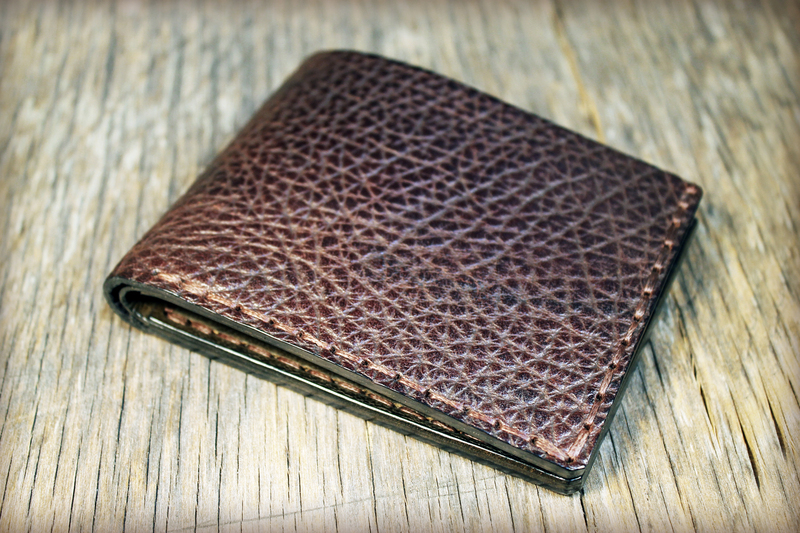 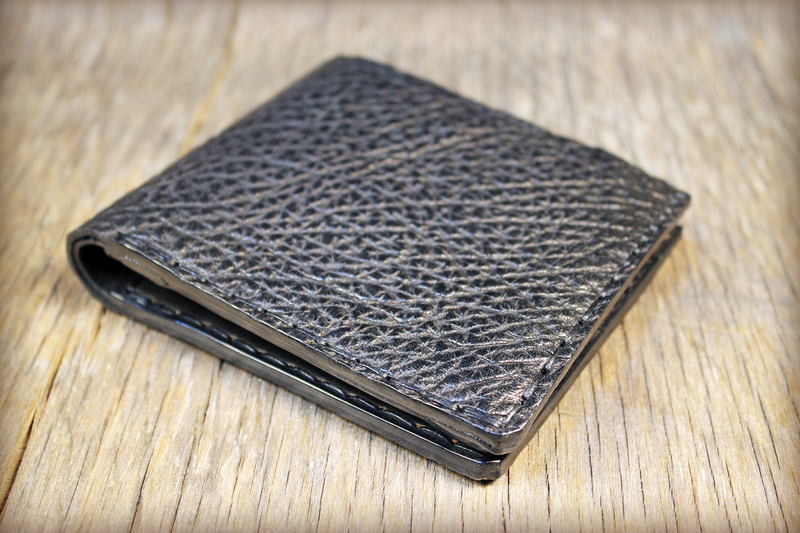 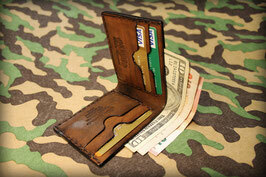 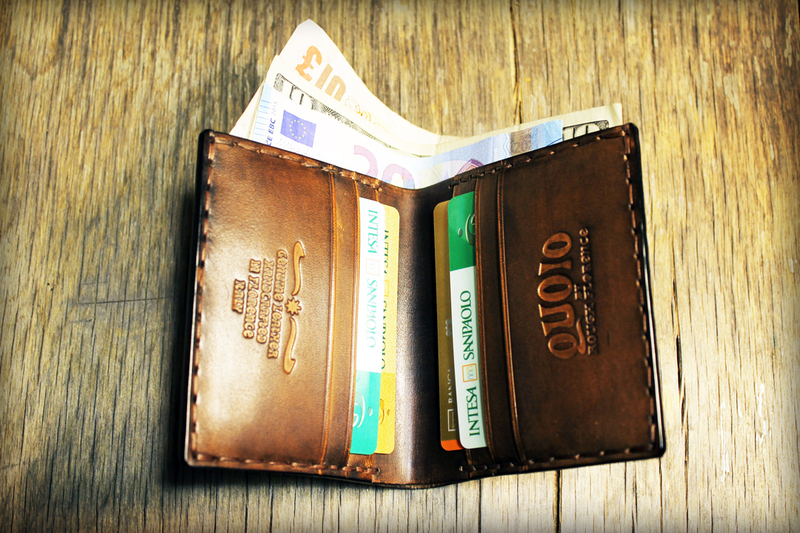 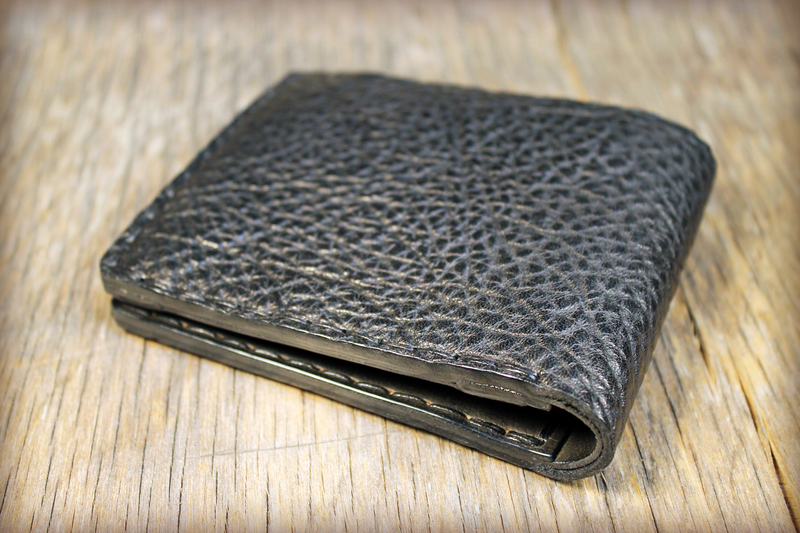 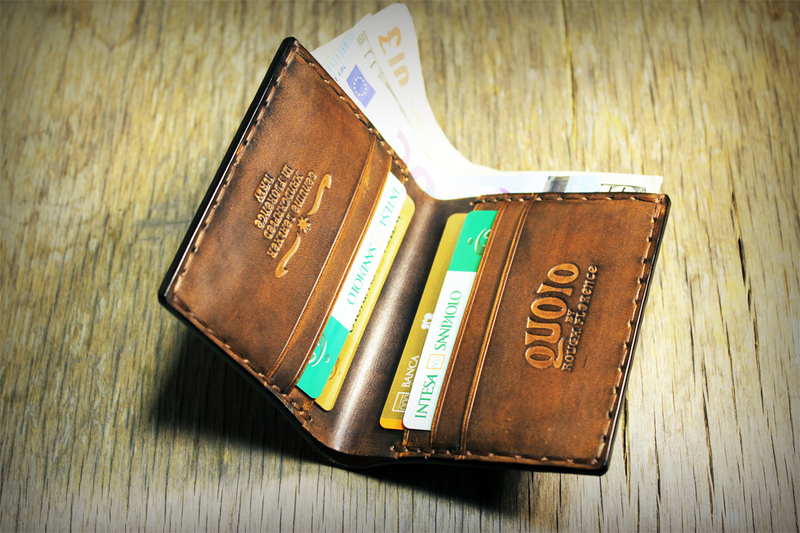 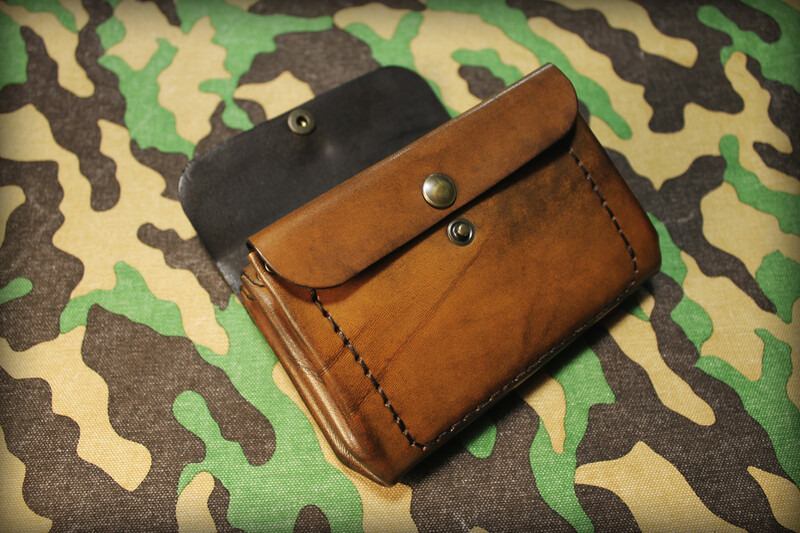 Men's Leather Money Clip Wallet. 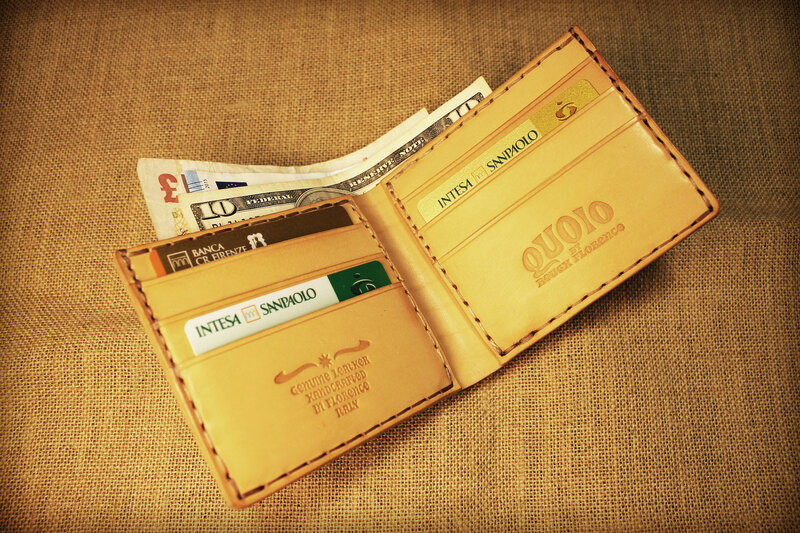 Unisex Credit Cards Leather Wallet. 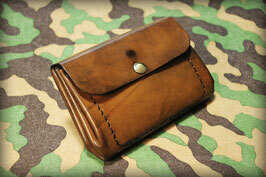 This is not a sewing machine product, but a high quality leather wallet, made to order, hand dyed on natural leather. 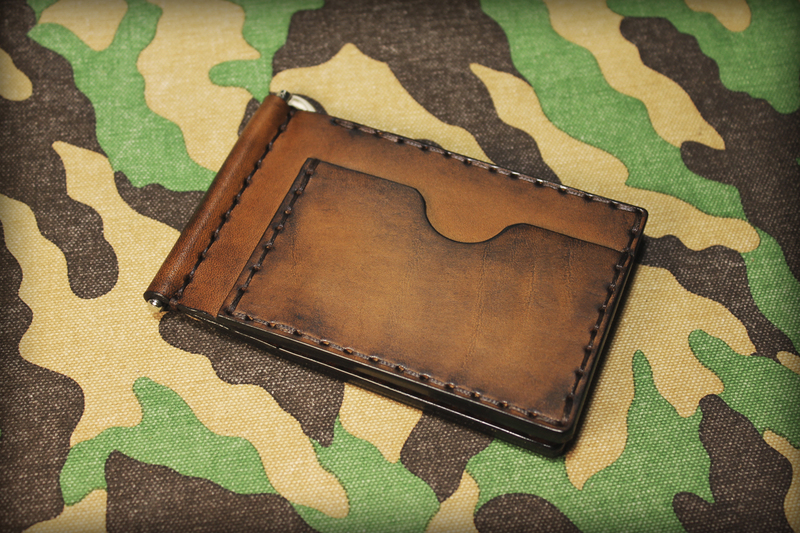 This Wallet style is made with two different types of leather. 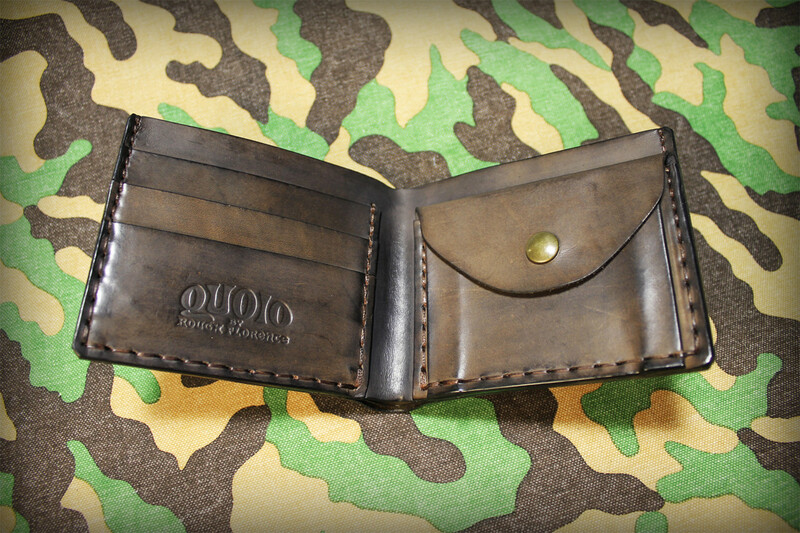 Wallet outside cover is grainy Buffalo while inside organizer is smooth leather. 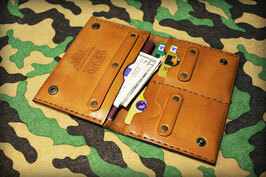 This is not a sewing machine product, but a high quality leather wallet, made to order, hand dyed on natural leather. 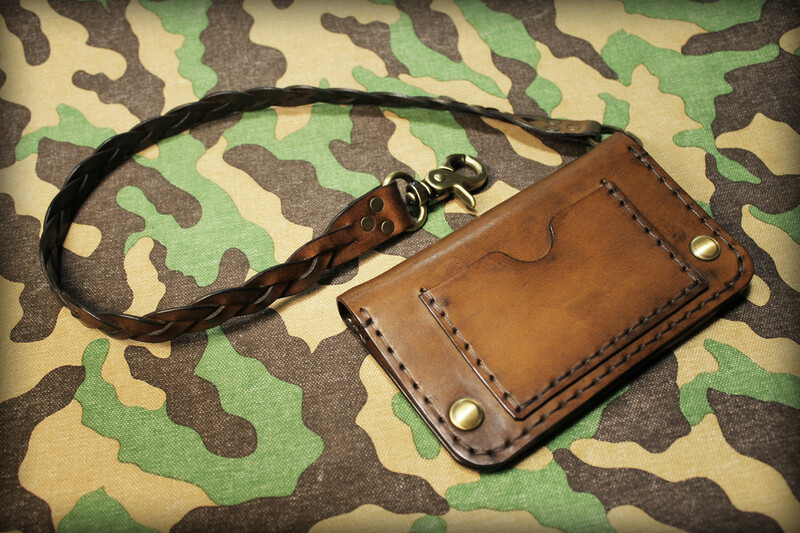 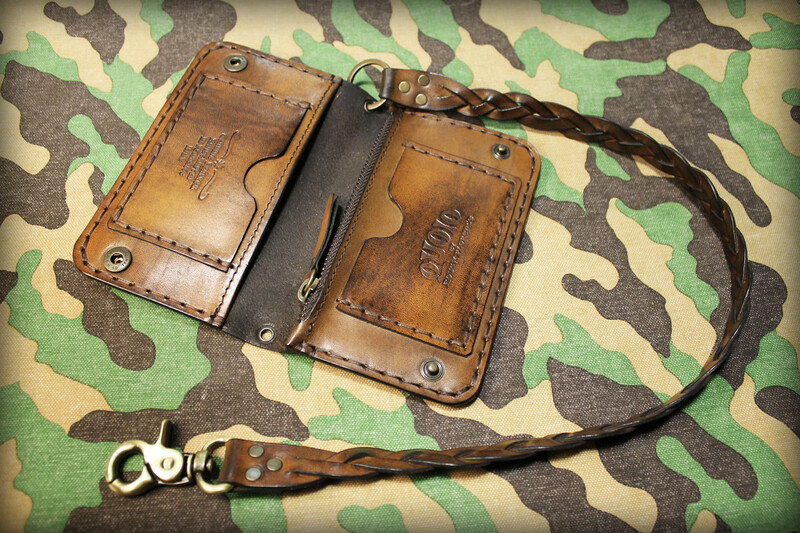 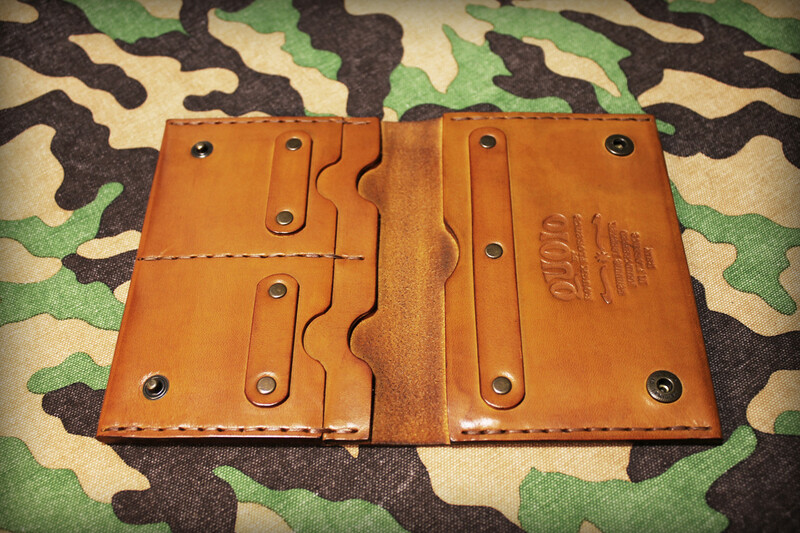 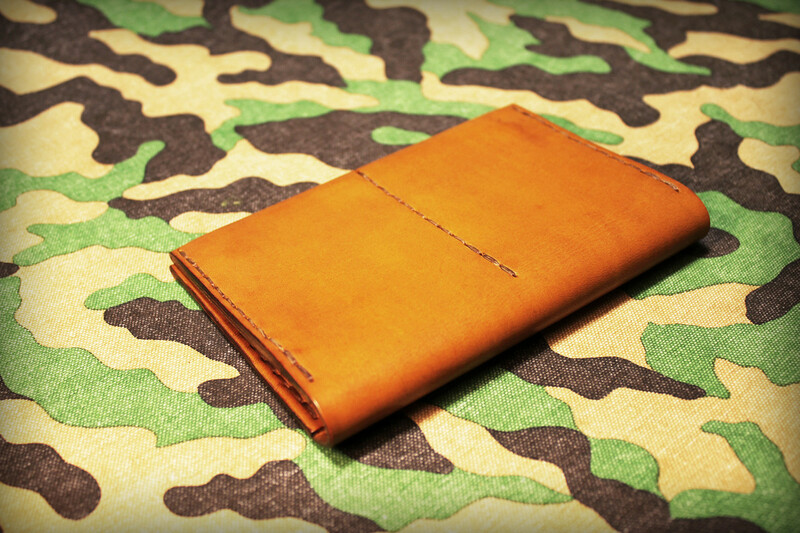 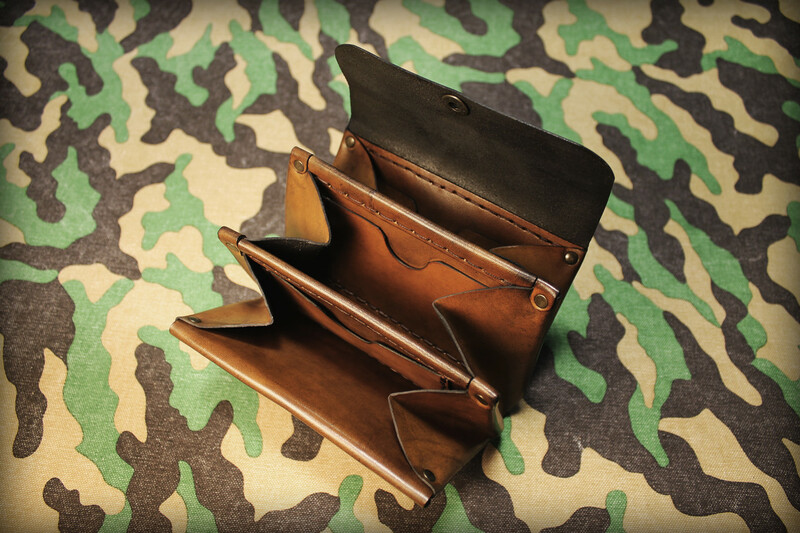 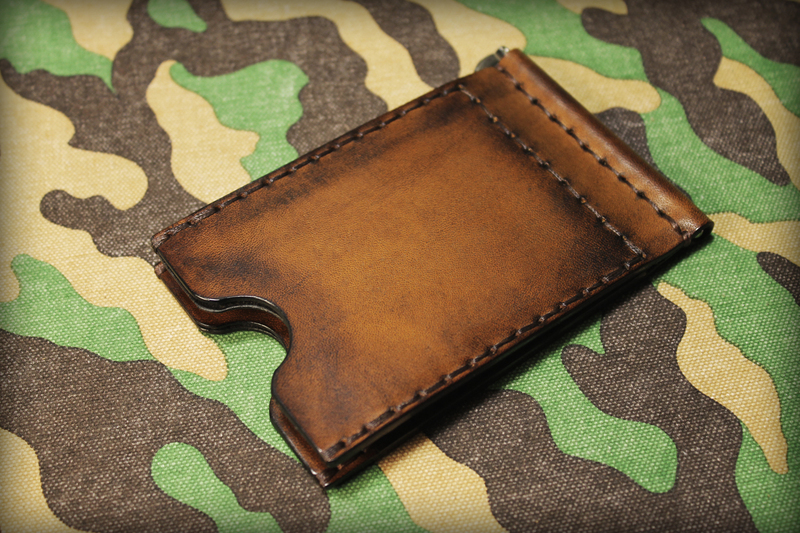 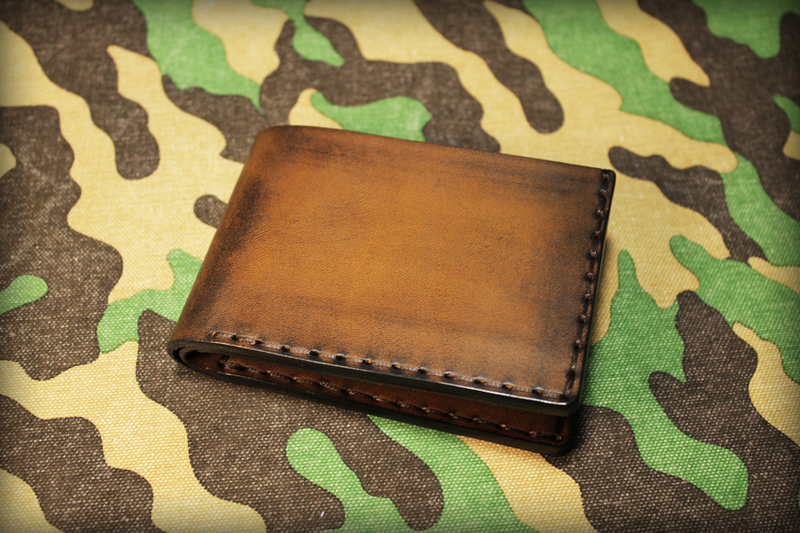 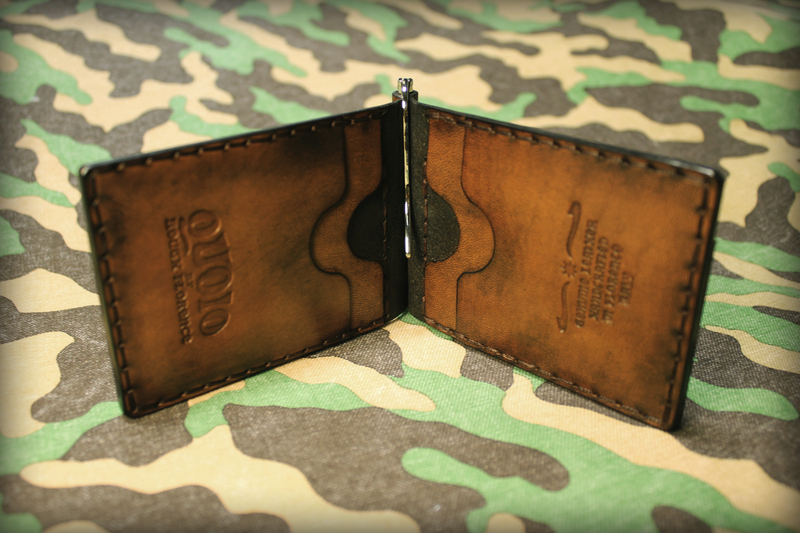 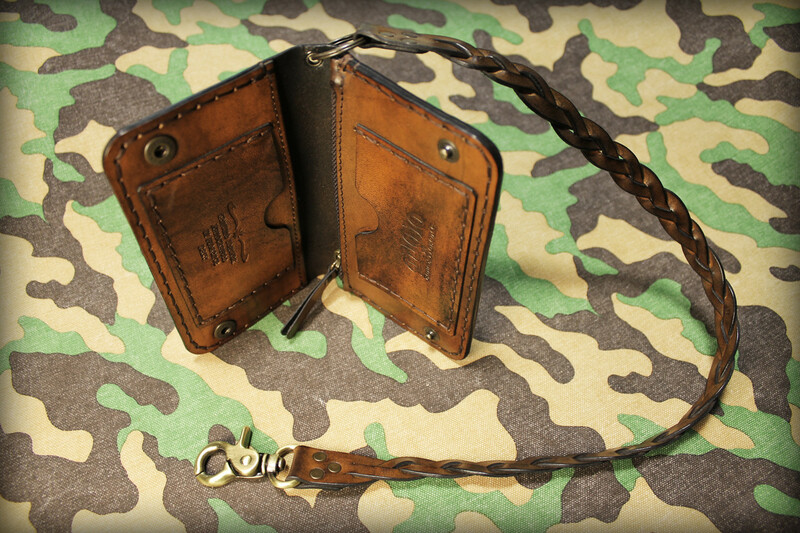 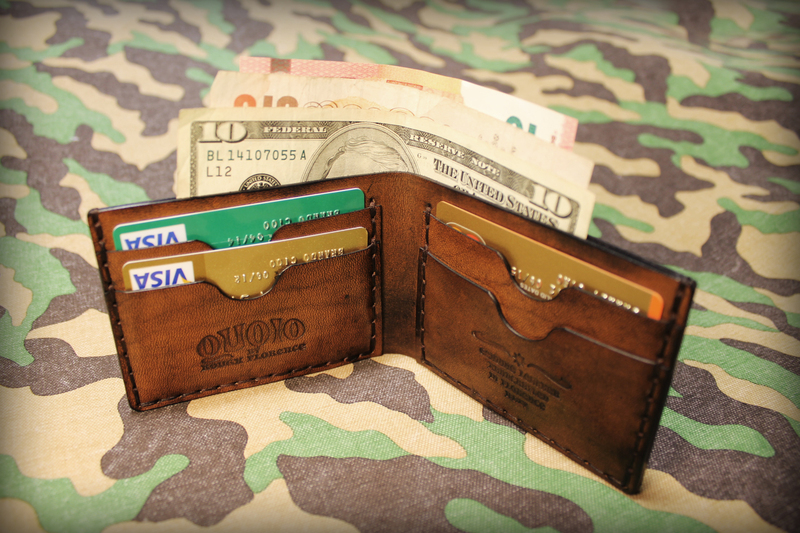 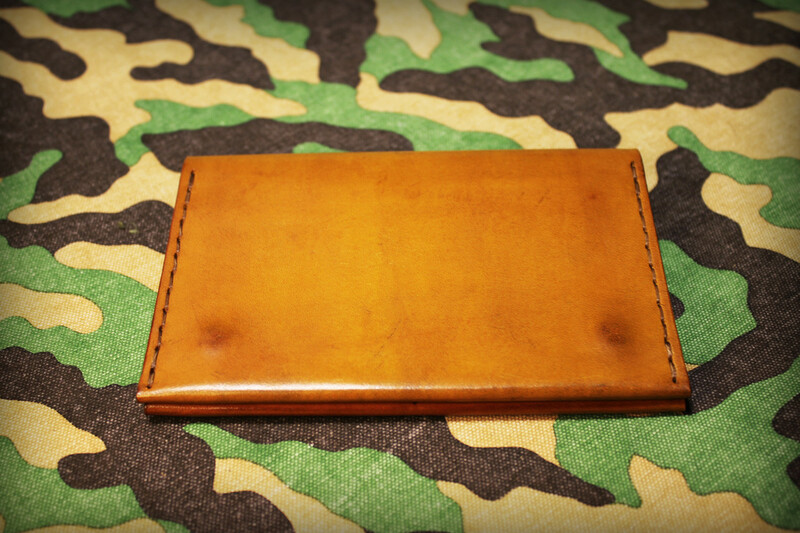 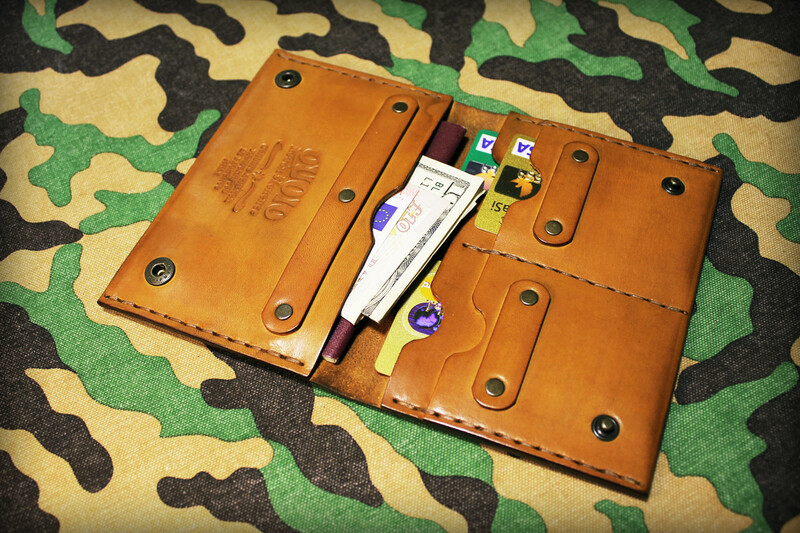 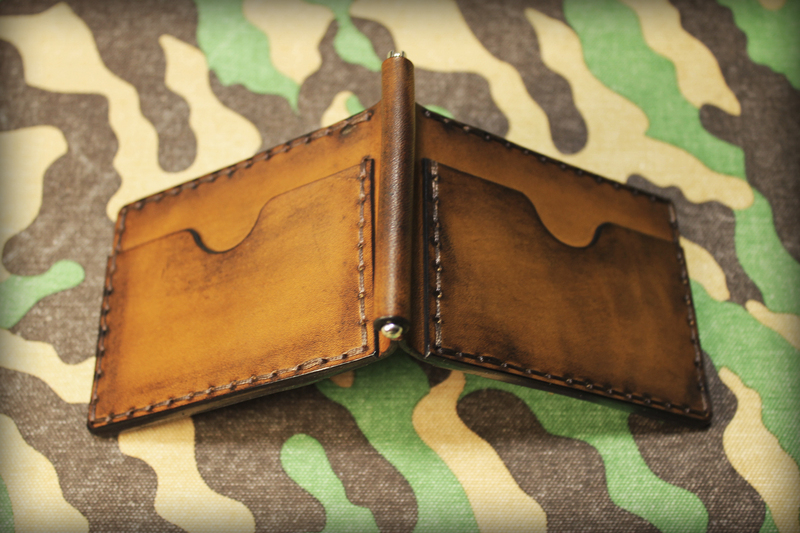 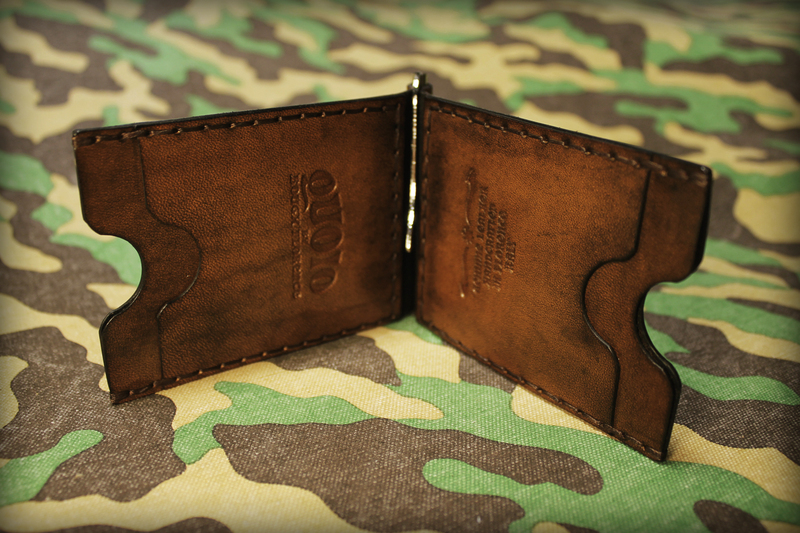 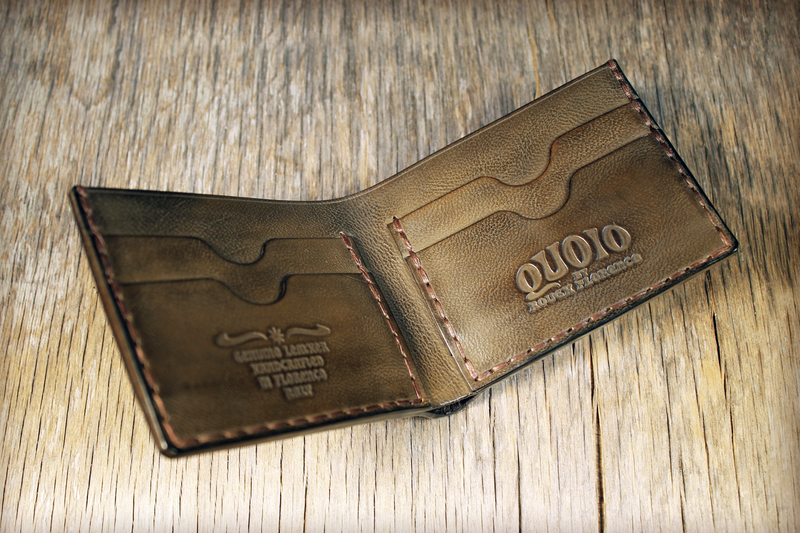 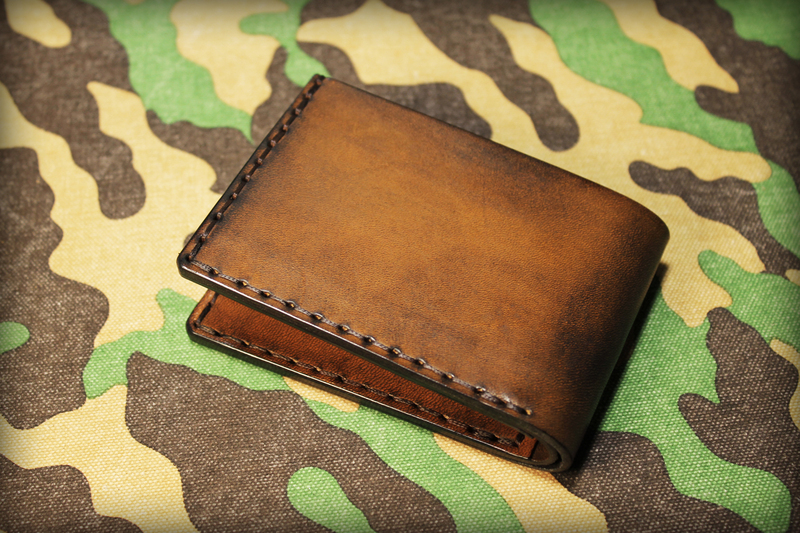 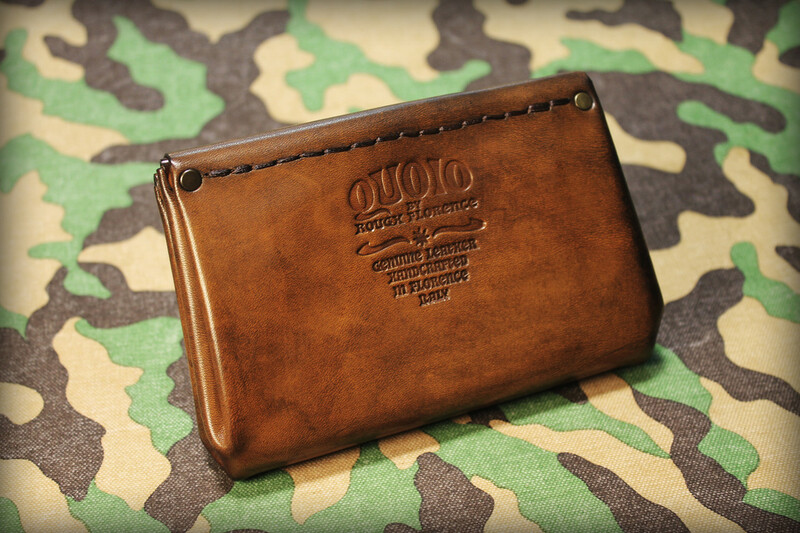 This Wallet style is only available in the shown color. Made of Genuine Vegetable Tanned Leather, Hand Stitched with Waxed Thick Thread. 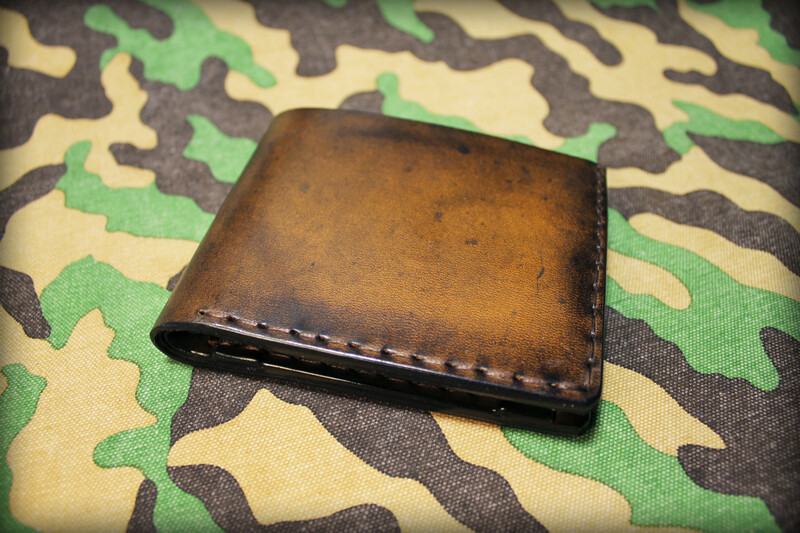 Hand Dyed and Finished to achieve warm color and aged look. 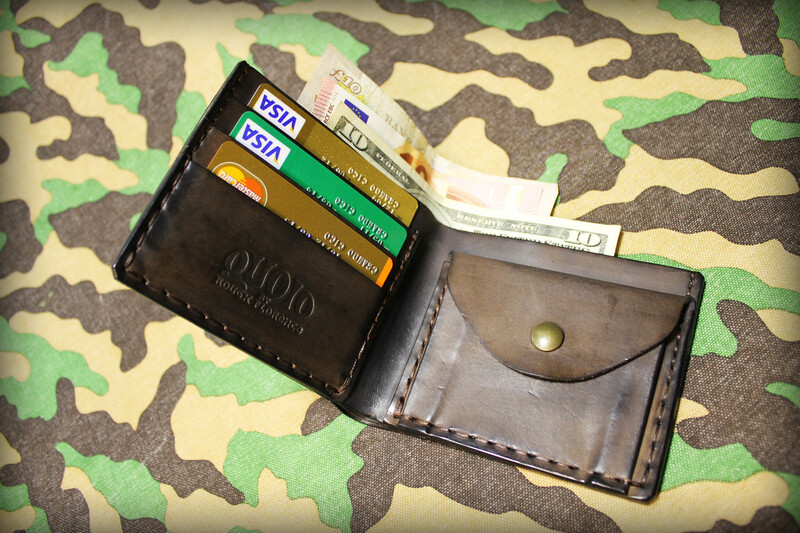 This Wallet style is only available in the shown color. 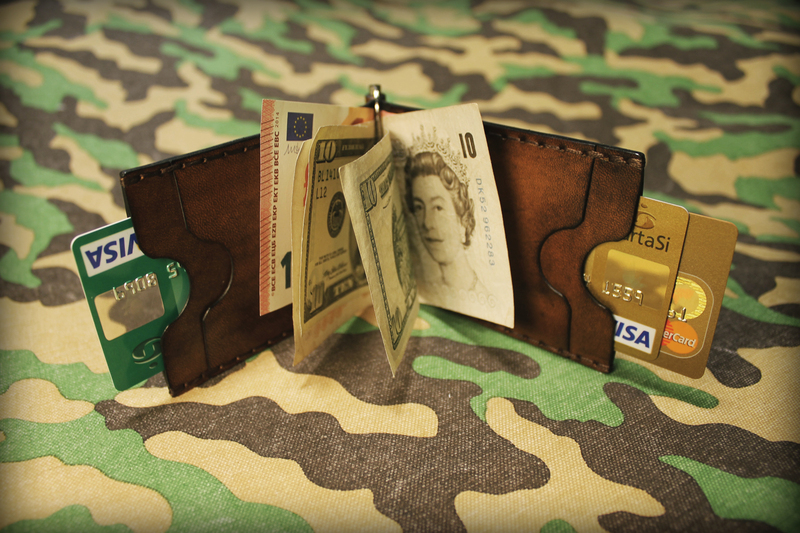 This wallet can hold up to 5/6 credit cards. 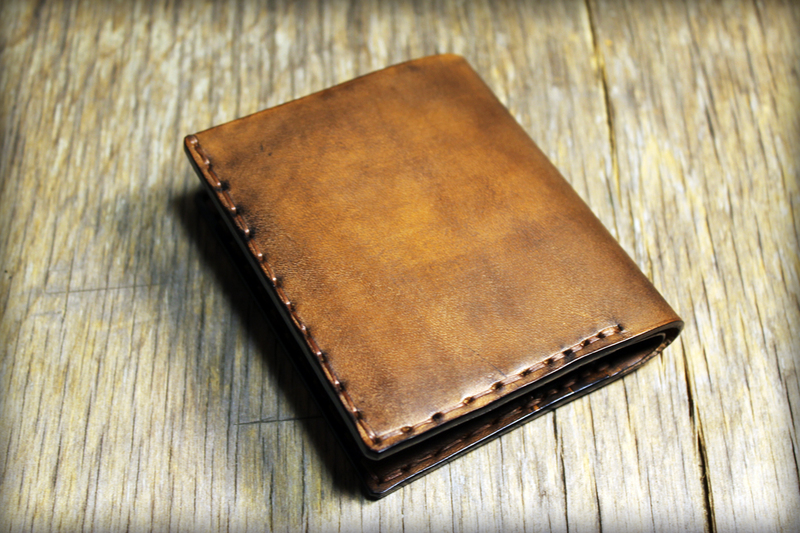 Made of Genuine Vegetable Tanned Leather, Hand Stitched with Waxed Thick Thread and finished to achieve warm color and aged look. 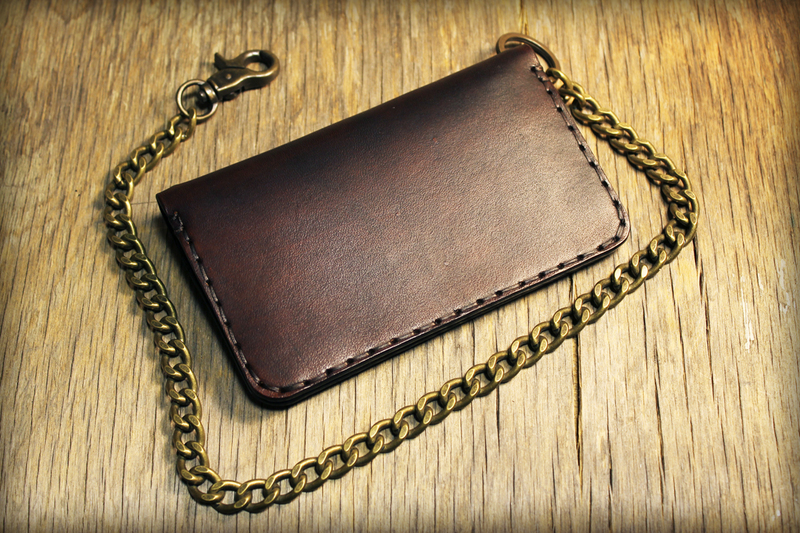 Size: Height 9 cm / 3.55" - Width 7 cm / 2.75" - Thickness 5 mm / 0.20"
Made of Genuine Vegetable Tanned Leather, Hand Stitched with Waxed Thick Thread. 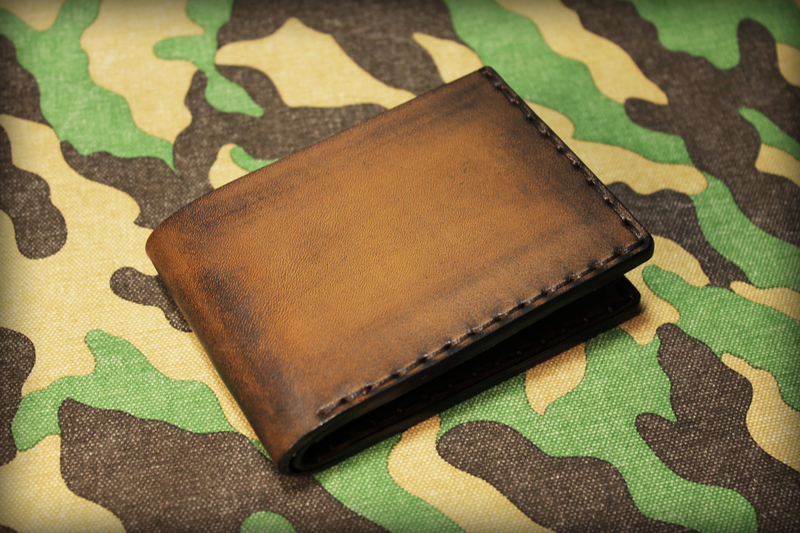 Hand Dyed and finished to achieve warm color. 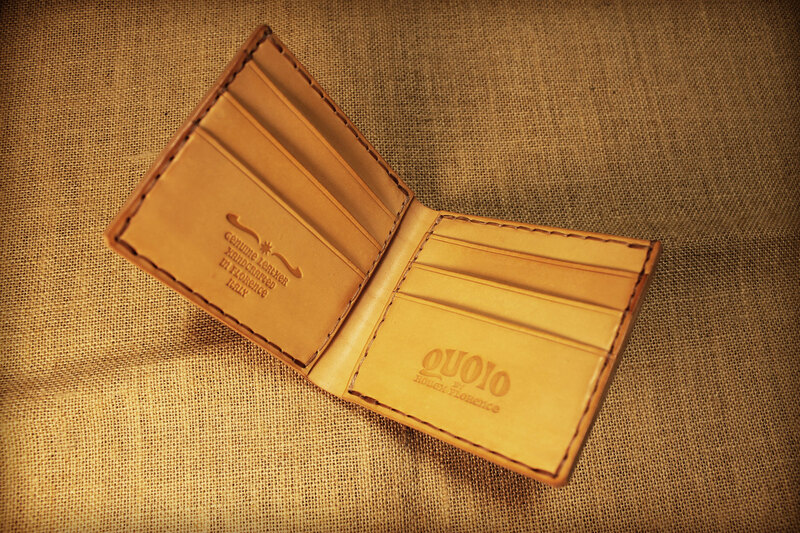 Size: Height 8 cm / 3.14" - Width 10,5 cm / 4.13" - Thickness 10 mm / 0.40"
Size: Height 7,5 cm / 2.95" - Width 10,5 cm / 4.13" - Thickness 7 mm / 0.28"
Made of Genuine Vegetable Tanned Leather, Hand Stitched with Waxed Thick Thread and finished to achieve warm color and aged look. 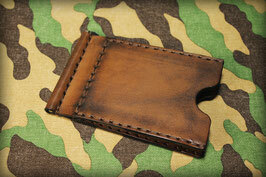 Size: Height 7,5 cm / 2.95" - Width 10,5 cm / 4.13" - Depth 17 mm / 0.67"